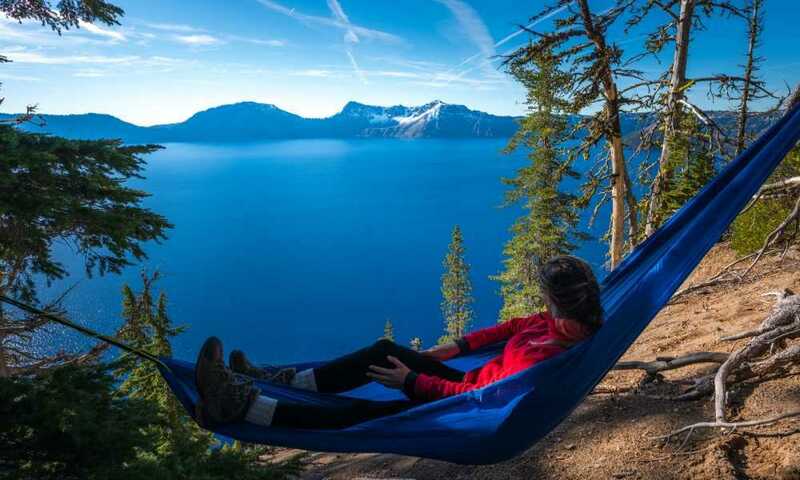 The length of your hammock refers to the length of the hammock from point to point (ring to ring) without the distance of the ropes factored in. Your hammock’s length determines the minimum space that it needs and the distance between the two fixing points. Each hammock’s height is also set relative to this measure, with 45% of the length being the most comfortable hang height for most. 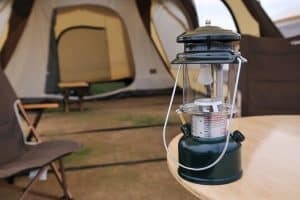 Here we’ll be taking you through a look at various ways that you can compensate for support posts which are either less or more than the ideal distance apart, while showing you other areas where the length of your hammock makes a definite impact and how to measure hammock length. The perfect length of hammock depends largely on your height, with the total weight which it will be carrying also making a difference. Most agree that a hammock which is 4 ft. longer than the user’s height makes for the most comfortable single-person choice. The extra 4 ft. gives you enough length and sag to hold your frame relatively flat when the hammock is correctly hung. Taller individuals of heights around 5’9” and above should increase this length to at least 4’6” for optimal comfort. A hammock which is too short for your height results in back-, neck- and knee-related pain due to the irregularly crouched position which it forces you into once you are completely relaxed. Short hammocks are for seating – not sleeping. 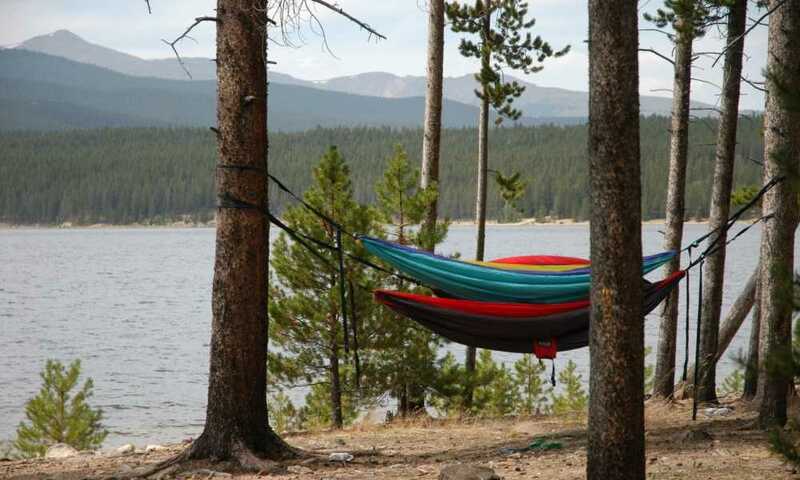 As the total length of your hammock increases, so does the total distance of your hammock post spacing and the total area which it encompasses. Always factor in the ridgeline length of your tarp before hanging your hammock. The straps and height of your hammock can be adjusted accordingly in order to allow the tarp its full extent of cover. This guarantees that your hammock stays shaded even when swaying slightly. Keep in mind that as your hammock length increases so will the height at which you mount it rise. This can create an excessive amount of sag if you are far shorter than the hammock provides support for. Never buy a hammock which is excessively long nor too short as both will be difficult to hang and very uncomfortable. A hammock which is far longer than your height needs can even be slightly uncomfortable causing knee strain when hung at the right height and hammock post spacing. The total distance of the hammock posts should be roughly 20% longer than the total length of the hammock plus its ropes. To calculate this simply, multiple the length of your hammock and its rope extent by 1.2 and work from there. When looking to secure your hammock to a natural fixture, such as trees or boulders, adjustments within the range of 15% are possible while still give stable, comfortable support to your body. If your hammock measures roughly 13 ft. or less, consider buying a premade stand for it. Longer hammocks can have custom stands made for them; however, this typically comes at a considerable cost. The added weight support which a lengthier hammock supports by default makes procuring a frame increasingly difficult as hammocks get larger. Yet, if you are looking for a small hammock for relaxing on a patio, sunroom or any other indoor-outdoor area, then be sure to be on the lookout for a stylish stand to accompany it. Long hammocks should generally feature a spreader bar to allow you a shorter hammock post spacing than would be needed without. Hammocks featuring compact spreader bars are great for camping, remaining easy to transport and helping to improve the overall support. Hammocks featuring spreader bars should always be considered by anyone who plans to be sleeping two-up in their hammock. A brand-new hammock may be shorter than its advertised length when it is first hung. It is best to manually measure the total length of your hammock before hanging it in order to determine the optimal height, spacing and rope adjustments. As the length of your hammock increases you will need to make slight changes to the hang angle. Single-person hammocks measuring roughly 10-13 ft. work well with a 30° hang angle but longer hammocks will need to change the height at which one of the posts is attached with variations in the tilt of up to 15° being necessary to give comfortable, form-fitting support.